Continued erosion of Frontier's business has shares trading down more than 50% year to date. 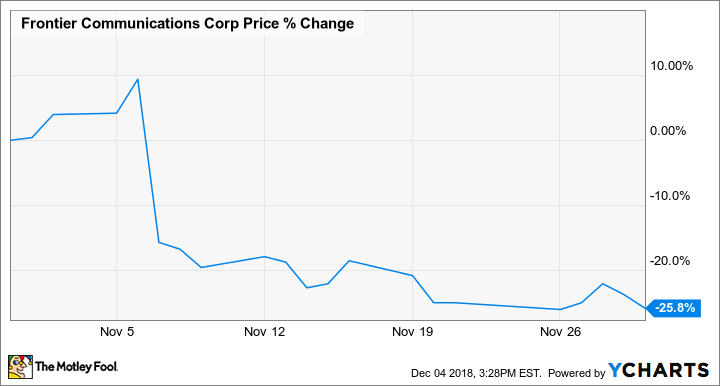 Shares of Frontier Communications Corporation (NASDAQ:FTR) sank 25.8% in November, according to data provided by S&P Global Market Intelligence. The telecom company's stock plummeted following third-quarter earnings results that added to a string of recent disappointments and further dampened the business's outlook. 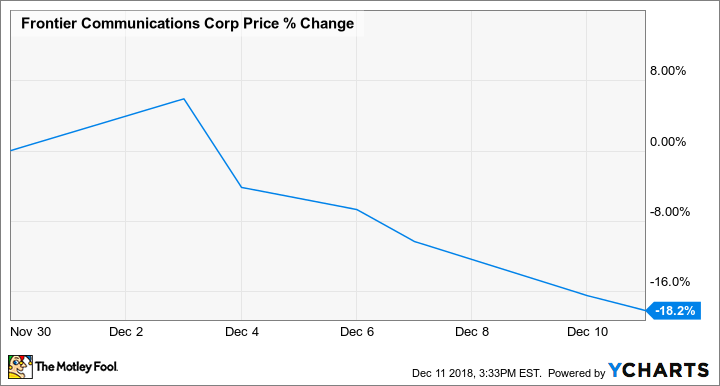 Frontier Communications reported third-quarter results on Nov. 6, recording a loss of $426 million for the period and shedding 93,000 customers across the stretch. With cord-cutting trends accelerating, little in the way of diversification at the business, and no dividend to keep shareholders placated, Frontier stock could continue to slide. Frontier's third-quarter results solidified concerns that the business might be on an irreversible decline, and management's plan to improve performance by reducing operating expenses does not appear to be inspiring investor confidence. Sales for the quarter came in at $2.13 billion, down from $2.25 billion in the prior-year period, despite average revenue per customer increasing to $84.92 from $80.91. Continuing to increase prices has the potential to accelerate customer churn, and the company's heavy debt load and worrying free cash flow situation suggest a dismal future for the business. Frontier stock's big losses have continued into December, with shares trading down roughly 18.2% in the month so far. There doesn't appear to be any fresh news behind this month's sell-offs, but without any positive developments to entice investors or mediate the business's bleak outlook, it's not surprising that shares are seeing big declines amid a sell-off for the broader market.